With over 12,000 R packages on CRAN alone, the choice of which package to use for a given task is challenging. While summary descriptions, documentation, download counts and word-of-mouth may help direct selection, a standard assessment of package quality can greatly help identify the suitability of a package for a given (non-)commercial need. Providing the R Community of package users an easily recognized “badge” indicating the level of quality achievement will make it easier for users to know the quality of a package along several dimensions. In addition, providing R package authors and maintainers a checklist of “best practices” can help guide package development and evolution, as well as help package users as to what to look for in a package. The R Consortium Infrastructure Steering Committee (ISC) is exploring the benefits of recommending that R package authors, contributors, and maintainers adopt the Linux Foundation (LF) Core Infrastructure Initiative (CII) Best Practices Badge. This badge provides a means for Free/Libre and Open Source Software (FLOSS) projects to highlight to what extent package authors follow best software practices, while enabling individuals and enterprises to assess quickly a package’s strengths and weaknesses across a range of dimensions. The CII Best Practices Badge Program is a voluntary, self-certification, at no cost. An easy to use web application guides users in the process. 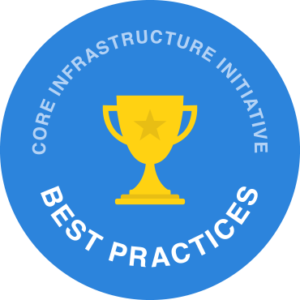 More information on the CII Best Practices Badging Program is available: criteria, is available on GitHub. Project statistics and criteria statistics. The projects page shows participating projects and supports queries (e.g., you can see projects that have a passing badge). As a potential initiative for the R Community, we encourage community feedback on the CII for R packages. Also, consider going through the process for a package you authored or maintain. Your feedback will help us and the Linux Foundation evolve the CII to further benefit the needs of the R Community, and FLOSS projects in general. Please provide feedback using this survey.